Lately I’ve been reading multiple books at once, a chapter here andc there of completely unrelated things: the second Denton novel by Kenneth Cameron, No-Man’s Lands by Scott Huler (about retracing the journeys of Odysseus), an unbelievably detailed book on the making of Close Encounters of the Third Kind, and a novel for which I’ve been asked to do a cover blurb. 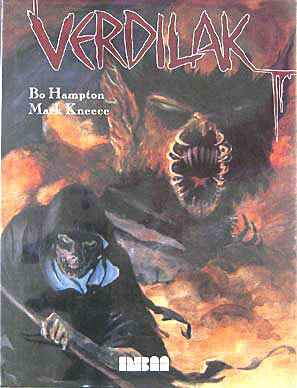 Usually I’ll get into one of these at the expense of the others and read it through to the end before returning to the pile, but in this case I got pulled off-track by something I unexpectedly found in a local used book store: the 1996 graphic novel Verdilak, by Bo Hamtpon and Mark Kneece. The title, one of the many European terms for “vampire” (specifically one who preys only on loved ones) caught my eye first. 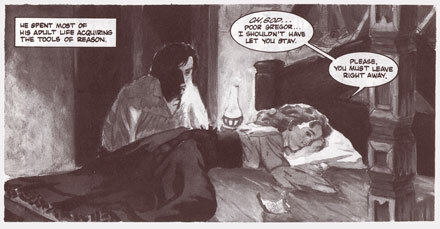 I first learned the word from the middle section of Mario Bava’s 1963 anthology film Black Sabbath; when I opened the book, the artwork clearly referenced the Bava film, so at first I thought it was an adaptation. But it was actually something more subtle. It uses the Bava film as metatext, taking its visual clues not just from I Wurdelak but from other Bava films such as Black Sunday. It covers some of the same narrative ground, but with a far different beginning and resolution. And ultimately it becomes an epic, unlike the Bava film’s intimate familial horror. In the film, a young aristocrat stumbles on a family in the process of being consumed by the curse of vampirism. He tries to save the beautiful daughter, but it doesn’t go well. In the graphic novel, this simple tale is backstoried with an account of Ramash, a deformed dwarf who takes in a beautiful peasant girl (the other daughter of the doomed family), showers her with affection only to have her run off with the first handsome man who comes along. And at the end, Ramash’s father (Satan) shows up to aid his son in his revenge. It’s a simple story, carrying the weight and atmosphere of folklore, and it broadens and deepens Bava’s original by providing motivations and explanations the film never really needed. But for me, what makes it special is the watercolor artwork by Bo Hampton. He recreates Bava’s imagery without pandering to it, making it work in a different medium. He also adds enough of his own touches that it feels original, not merely a recreation. His most crucial change is rethinking the image of the family patriarch. In the film Boris Karloff’s kindly eyes provided an eerie contrast to his actions. Here the character bears a greater resemblence to Josef Stalin, which is appropriate given the revised context. Verdilak is out of print, but worth the effort to find. It’s a powerful introduction to the concept of the adult fairy tale, and lacks the annoying tendency to blatantly “meta” its source; in fact, it’s “meta” only if you already know the source. If you don’t, it’s a sincere, irony-free horror story with the kind of moral basis found in real fairy tales, the ones that stick in your memory long past childhood.